A Few Sprinkles Short of a Sundae: Have a Christ-Centered Christmas! 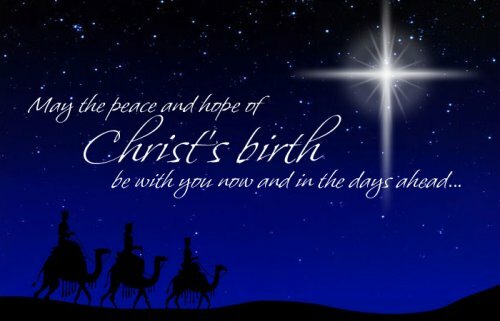 I wanted to wish each of you a Christ-Centered and Filled Christmas this week! I hope you are surrounded by family and friends. I hope you are stuffed to the gills with delicious food and hearty laughter. I pray that the love of Christ permeates every inch of your holiday! I will be taking a blogging break this week and will return to you in January! God bless you! 1 At that time the Roman emperor, Augustus, decreed that a census should be taken throughout the Roman Empire. 2 (This was the first census taken when Quirinius was governor of Syria.) 3 All returned to their own ancestral towns to register for this census. 4 And because Joseph was a descendant of King David, he had to go to Bethlehem in Judea, David’s ancient home. He traveled there from the village of Nazareth in Galilee. 5 He took with him Mary, his fiancée, who was now obviously pregnant. 6 And while they were there, the time came for her baby to be born. 7 She gave birth to her first child, a son. She wrapped him snugly in strips of cloth and laid him in a manger, because there was no lodging available for them. 31 which you have prepared for all people. 36 Anna, a prophet, was also there in the Temple. She was the daughter of Phanuel from the tribe of Asher, and she was very old. Her husband died when they had been married only seven years. 37 Then she lived as a widow to the age of eighty-four. [c] She never left the Temple but stayed there day and night, worshiping God with fasting and prayer. 38 She came along just as Simeon was talking with Mary and Joseph, and she began praising God. She talked about the child to everyone who had been waiting expectantly for God to rescue Jerusalem. 39 When Jesus’ parents had fulfilled all the requirements of the law of the Lord, they returned home to Nazareth in Galilee. 40 There the child grew up healthy and strong. He was filled with wisdom, and God’s favor was on him.